Editors Note: There are 2 figures accompanying this press release. BlackBerry Limited (NASDAQ:BBRY)(TSX:BB), a world leader in mobile communication, today announced that BlackBerry® Enterprise Service 10 (BES10) is the most cost effective multi-platform enterprise mobility management solution, according to a report by the global market research firm Strategy Analytics. "Our detailed report found that the pricing offered by BES10 creates a lowest-cost migration path from a TCO perspective", said Andrew Brown, Executive Director, Enterprise Research at Strategy Analytics. "We attribute this to multiple factors, including the Enterprise Server License Trade-up program, the impact of BlackBerry Software Assurance across its Advanced and Premium support categories, and new tiered support categories." The Strategy Analytics report, "Enterprise Mobility Management: A Review of Total Cost of Ownership,"1 found that BES10 is the lowest cost Enterprise Mobility Management (EMM) solution based on a five year total cost of ownership (TCO). Migrating from BlackBerry Enterprise Server 5 (BES5) to a BlackBerry competitor is, on average, more than double the cost over five years than migrating from BES5 to BES10. The Strategy Analytics report went on to note that the "all inclusive" nature of the BlackBerry offering provides a tangible cost advantage which is then sustained throughout the TCO period. "BlackBerry customers consistently tell us that cost, coupled with world-class security, is a top priority when choosing a multi-platform mobility management partner," said John Sims, President, Global Enterprise Solutions, BlackBerry. "The report exemplifies why BlackBerry is the only company that can support the full range of EMM requirements, from the most secure to the most open BYOD environments. Customers also recognize the additional security provided from our global NOC infrastructure. No other company has this range of capabilities and we will work diligently to earn the trust of enterprise customers globally." 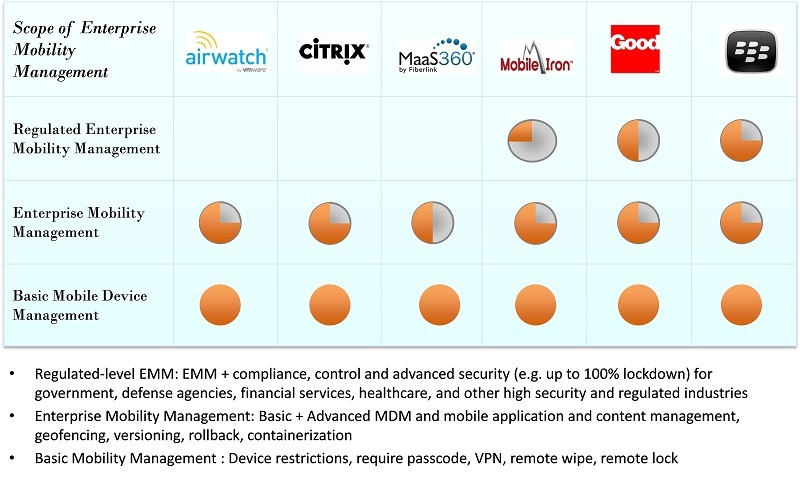 Lowest TCO for EMM deployments in regulated and high-security environments: Even in a fully regulated environment where BlackBerry offers the highest form of security, it also proves to be the lowest cost solution based on a five year TCO. Highest security: CIOs and IT decision makers listed BlackBerry as the most secure solution. The report concluded that competitors do not offer the same level of IT policies and compliance controls as BlackBerry and cannot deliver a similar end-to-end security model. Customers are realizing the benefits and cost savings of the recently launched BlackBerry program, which provides free license migration and support for BlackBerry customers to move from BES5 and other MDM platforms to BES10. Since the program launched on March 31, 2014, more than 800,000 BES10 client access licenses have been issued to customers worldwide. The enterprises participating in the program represent a cross-section of industries from financial services and healthcare, to telecommunications and government organizations. Migrations to BES10 include customers using other MDM vendors such as AirWatch, MobileIron and Good Technology. The BlackBerry EZ Pass migration program is designed to help customers take full advantage of the BES10 multi-platform solution by seamlessly migrating from BES5 and includes access to BlackBerry's technical support services. For more information about the BlackBerry EZ Pass migration program, please visit: www.blackberry.com/ezpass. For more information about BES10, please visit: www.bes10.com. For more information about the Strategy Analytics report, please visit www.blackberry.com/tco. Strategy Analytics is a global organization with analysts based in the Europe, Asia and the Americas. Our local presence allows us to understand regional markets, and conduct primary research and manage consulting projects with a high degree of control and, as a result, impeccable data integrity. Our analysts specialize in tracking, analyzing and forecasting markets that include: wireless devices, consumer electronics, automotive electronics, entertainment and media, defense systems, telecommunications and related digital products and services. Our consulting group conducts custom research projects, applying the company's proprietary analytics and vast data resources to client engagements. We are also the only analyst and research provider with an in-house user experience practice and digital home observatory. 1 The report was commissioned by BlackBerry.